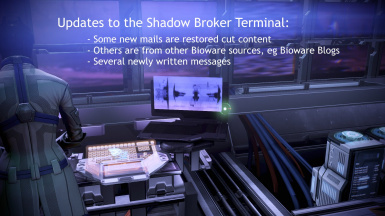 The purpose of Spectre Expansion Mod is to improve the under used Shadow Broker and Spectre terminals, to give the player new difficult choices to consider via Spectre authorisations, to improve the presence of background races in ME3, to expand the galaxy map and provide clues to the battles happening beyond the scope of Shepard’s missions. THIS IS A PUBLIC BETA OF THE MOD. PLEASE BEAR THIS IN MIND WHEN COMMENTING. KEEP AN EYE OUT FOR UPDATES THAT ADD MORE CONTENT IN THE COMING WEEKS. Spectre Expansion Mod was first created to address one section of the game that I felt was lacking; the Spectre Terminal. 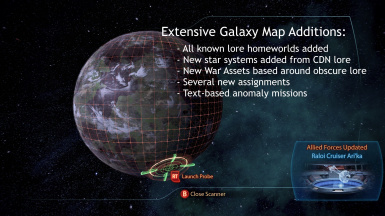 Since then it has vastly grown in scope to include updates to the Shadow Broker terminal, a new shop and items, combat mission additions, address some item gamification, improve the content for the less powerful aliens and to expand the galaxy map to include homeworlds from the background lore and new anomalies and galaxy map assignments. In addition I have also begun work on a quest chain called the Ghosts of Antilin, this will expand with each patch and it focuses on one of the background lore alien races. I also hope to expand content for other lesser own species as well. 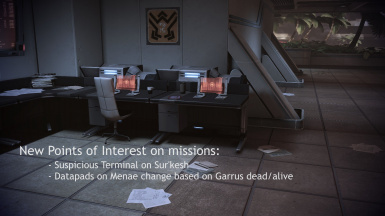 The additions to the Spectre Terminal are two fold; first I have included new mails that detail events in the wider war against the Reapers, not those areas that of the war that Shepard is involved in. The Reaper War is fought across hundreds of planets in the galaxy, so I felt there was great scope for detailing other events that were happening. I have made an effort with each message to detail plausible events that could happen within the setting. Alongside these are a dozen new authorisations for the player to consider. These offer decisions for Shepard to make that extend beyond the usual choices, for example you can authorise controversial research into husk armaments or the hacking a diplomats databanks. Each choice will have consequences, but you must weigh up whether they will benefit or hinder the war effort. The choice is yours. These changes are found during two missions, Priority: Palaven and Priority: Sur'kesh. 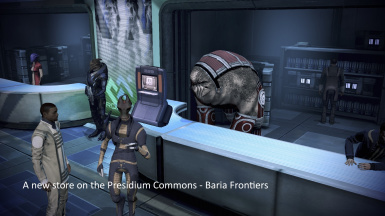 The edits to Priority: Palaven are limited to the safe hub area where you find General Corinthus and meet up with Garrus. If Garrus lived then the datapads are exactly as they are now, but all the datapads change if Garrus died during the Collector Base mission. 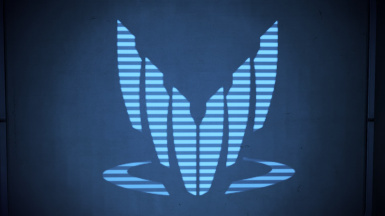 The new datapads highlight some of the impact that his death had, namely that the defences on Menae were not boosted and the turians were caught unawares against the Reapers. The galaxy map has undergone a number of expansions to its content. As mentioned above, you can now buy star charts that will open up new star systems to explore. Each of these star systems is based around a planet that is found in the lore from the games, books, comics and Cerberus Daily News articles. These may provide you with new assets for the war, and in some you may find anomalies to explore. These anomalies take the form of brief text adventures. In time I hope to add more anomalies, and potentially more star systems. I have also added several new galaxy map assignments and quite a number of new war assets in existing star systems. These are all tied to more obscure lore or to certain characters, for instance, you can find Corsairs orbiting one planet. For those who may not know, Jacob was once a Corsair when he was with the Alliance. ﻿The Ghosts of Antilin is a new side story that you'll be able to play through. The start to the storyline is found on Sur'kesh on a new terminal, and after that it will be told in a variety of ways such as authorisations, galaxy map assignments and text adventures. The story revolves around one of the background alien races, but I won't spoil who. It's also my intention to provide more content for those less powerful races and factions. I was not a big fan of how Mass Effect 3 threw aside most of the interesting aliens (hanar, volus, elcor, etc) to focus on the more human factions such as the Krogan or Turians. It made them feel useless, when they had their own strengths, weaknesses and plots. As such, it's my intention to give them a little more of a role where I can, and to do so for every surviving background alien species as well. I cannot give them their own combat missions, but I can provide other content for them, and aim to add more as I release more patches. A pet hate for me is when games companies dumb down their games by reducing upgrades to a level number. As such, I have tried to amend certain items in Mass Effect 3 to make the upgrades feel more immersive and natural. I have started by adjusting the names of each upgrade to your medi-gel that you can purchase from Sirta Foundation in the hospital. There are now 5 separate upgrades to your equipment that will boost your store of medi-gel and their effectiveness. I have also balanced the rest of the items within Sirta so that their cost feels more natural to the type of item that they are. 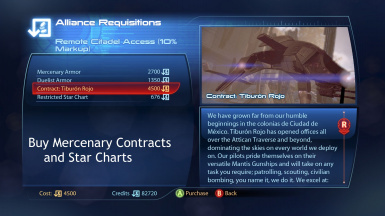 - At this time if you buy a Mercenary Contract then you do not immediately get the War Asset that you have bought. To do so you must access the Spectre Terminal. - ﻿For the beta you can only authorise Spectre authorisations, there is no refuse button yet. The current way to refuse is not to click on authorise and to move on from the message. I hope to find a more interactive method of allowing a player to refuse in the future. 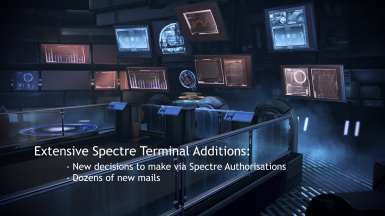 - For Patch v0.85 you must go to the Spectre Terminal in the Embassies to get the new mission rewards. This will be amended for v1.00. - The Ghost of Antilin War Assets are using placeholder artwork. ﻿It is my intention to continue adding and amending the game until the final release of Spectre, but this BETA contains a lot of content already. I should also be clear that the mod requires EGM - Expanded Galaxy Mod to work. If you use my mod without it, then it will cause a lot of bugs. Drag and drop the folder DLC_MOD_Spectre into your Mass Effect 3 DLC folder and then autoTOC . If using Mod Manager, then drag and drop the archive into Mod Manager to import it. After that all you need to do is apply the mod and build a compatibility patch using conflict detector. "Can I use this mod without EGM - Expanded Galaxy Mod?" [i]In theory, yes. But you would have significant issues with the galaxy map as the majority of star systems would lack names and descriptions. There would be many other bugs as well. I would not recommend it, and I'll be unable to provide support when it goes wrong (it will go wrong!). "Will you release a version that does not require EGM - Expanded Galaxy Mod?" I'm afraid not. It would require far too much work to get right and I would rather devote time to improving the project as it currently is. You mentioned new storylines, will these be new missions? Kind of. These will take place on the galaxy map, but because of limitations of the toolset (and my own skillset) we are incapable of adding brand new combat missions to the game. Maybe one day it will be possible, but for now the new storylines are told via galaxy map assignments, short text adventures and terminal messages. "You said you were adding content for the background races, but I've seen nothing for X, Y, or Z races yet. Why not?!" I have tried to add as much content as I can for the first release, but I still have a lot of content I want to add to the game. This means that some races only have the bare minimum of references or new content. As time wears on, I will try to expand these further. Some cluster textures are copied from other clusters. Will these get replaced once the beta is finished? My hope is to give each cluster that uses a duplicate their own unique texture by the end of the beta. I don't want to go into details about these just yet, but expect more of what I have already added (spectre authorisations, new planets, mini-text adventures etc. ), and if I'm adventurous enough, maybe some more complex additions. I have an idea, I'd love for you to add it to the mod! Would you? Potentially! I have a lot of my own ideas to get through first, but we can always discuss it over private message or you can post it in the Collection Point for Ideas article. At the least, you can always release it as a submod. Contact me if you want. Writer, Designer, Idea Guy, Tester, Almost Everything Else: Me! Kinkojiro - For teaching me how to mod this game, allowing me to use EGM's galaxy map as a base and many other things. The mod wouldn't have been possible without his support. Ravager - For so freely giving his work on Sur'kesh to the mod. Jorgen - For proof reading everything I wrote to say if he liked it or not and keeping me sane when I had to rebuild the mod from scratch. Deadspear, JonatanRek, Realsurvivor, & Orikon - For their interest in the mod and keeping my spirits up after the original version was lost. ﻿Duke the dog - For patiently listening as I'd read my writing to him. Such a good boy, yes he is! A good boy! ME3Explorer Toolset Team - Without your tools my ideas would still be on paper. Everyone else who ever took an interest in the mod or tried to help - Thank you.